We Can Haz Mobile Site! Ron found a plugin and associated theme to make the blog mobile device-friendly, and it’s installed and running. Very cool techie magic. Of you don’t understand why, ask someone to show you on their smartphone or other small-screen device. Yeah, a lot of cool stuff is stripped out, but it’s more eyeball-friendly, especially for us Olde Phartes and Dinosaurs (she says, ducking in anticipation of parental reading…). I suspect mobile versions would also be nice for some netbooks and users. Comments Off on We Can Haz Mobile Site! Ron has successfully installed WordPress on our website. My blog can be found here. (unless you’re already here reading it here…because I’m going to copy this over to LJ). Given the simplicity of using WordPress, and having my data under my control, I’m probably going to stop using my LJ and Blogger accounts. I won’t shut down my LJ account completely, since Google Reader won’t, AFAIK, pick up friends-locked entries. In all likelihood we’ll also be shifting the Otter Necessities blog over to WP on our own hosting, too. Not sure if I’m going to import my LJ. Probably, and I’ll probably also leave them up at LJ. I think I mentioned this before, but I consider FaceBook to be mainly for reading what others post, with occasional fluffy comments of my own. Given FB’s apparent attitude toward giving out user’s information (which I’ve minimized in my own case), that’s unlikely to change. I think there’s a way to limit access to entries here along the lines of the LJ friends-lock. I’ll update when I figure it out. Both Blogger and LiveJournal are unwieldy to post to from my iPhone, worse with posting pictures, and neither offer mobile views or offer a mobile posting app that dosen’t use text-messaging. Therefore, I’m giving WordPress a try. I’m very good at killing house plants, especially at home. 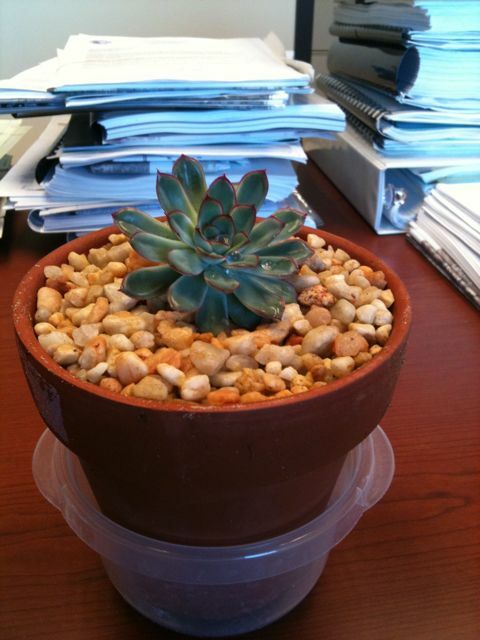 But I do have one little succulent at work that’s surviving. It’s been in need of more space for an emberassingly long while, but I finally took care of that this morning. Although I couldn’t find a pot I liked in stores, it turned out we had a perfectly servicable one at home. We were out of cactus/succulent potting mix (Robin has several,although IIRC the ridiculously-tall Lithops died), so I faked it with sand, mushroom compost, and top-dressing gravel. I even gave it a good layer of top dressing with said gravel.